and he had a .07 alcohol concentration. Wow, was he using a radar detector? E, do you guys do double fines for violations in posted work zones? We do up here in AK.. He didn't have one but it would NOT have worked anyway, as you can see, that is a time distance device. I was following him. I had clocked him earlier at 81/55 and came up behind him as he was speeding up. Rapid, the fines for speeding in a work zone are $250.00 plus the cost of court which is $438.00 at the moment. speed anyway. I also charged him for reckless driving since he was 42 MPH over the speed limit. people pleading guilty to DWI "It is not guilty to drink and drive, it is guilty to drink TOO much and drive"
E WHEN U SAY A WORK ZONE IS THAT I.E ROADWORKS ETC ....IF SO IN AUSTRALIA IT IS GENERALLY 40KMH IN THE CITIES/TOWNS...FOR COUNTRY IT IS GENERALLY 60KMH.....OUR ALCOHOL LIMIT IS .05 RIGHT ACROSS THE COUNTRY. JUST FOR THE .07 HE WOULD HAVE LOST HIS LICENCE FOR 7 MONTHS IF ITS HIS FIRST DRINK DRIVING OFFENCE .14 MONTHS IF SECOND OFFENCE AND SO ON..HE WOULD HAVE ALSO LOST HIS LICENCE FOR SPEEDING MORE THAN 30 KMH OVER THE SPEED LIMIT SENTENCE IS UP TOO JUDGES DISCRETION..AND FINES ROUGHLY ABOUT $1000.. Here in NC, to add the additional fine, it has to be "Posted" a work zone with a sign that states what the fine is going to be. "you have to add the court costs"
I guess they were willing to accept a $250.00 fine but when you add the court costs and it brings it up to $438.00 that it is more than they bargained for. I havent had a ticket or accident in the 15 years since. Rapid - I was afraid to over 55 in Alaska with all the animals running across the road. I wonder what kind of a mess it would be hitting a Moose at 147mph? 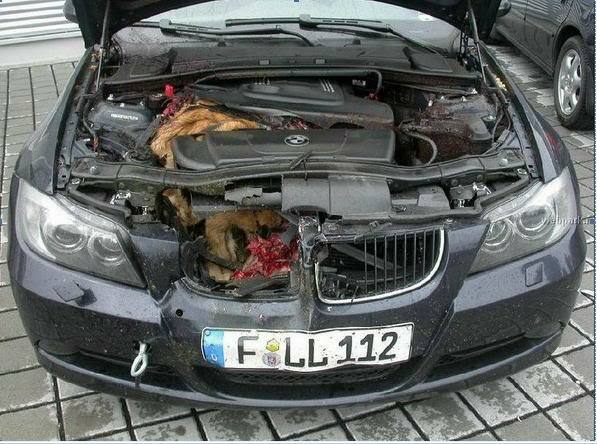 This is what a car looks like after hitting a deer/moose..